I have never seen this leafy herb(?) before… or at least I never took notice of it. Best I could tell, it may possibly be russian sage, a popular ornamental that is not in fact a close relation to the most common sage you and I might associate it with. If it is Russian sage, it can be used as a flavoring herb as well… but I haven’t seen it used in anything else either… websites seem to focus more on its flowers than on the leaves… At any rate, if you know more about these greens than I do (obviously I don’t know much), please leave a comment… thanks! Meanwhile, a quick note on the dying out of handwritten notes… It’s sad, but with the popularity of emails, texts, tweets, etc., the rather graceful, proper and civilized way of acknowledging thanks or conveying a piece of information or gift with an accompanying note is fast becoming an anachronism. We have been trying to teach the teen to do this effortlessly, but I guess for her generation this would be like my parents asking me to write with a quill and some ink… I was never a great note writer, but I do recognize why it is an important skill to have mastered… I guess I am getting older, and “old-fashioned”, but few modern means of communication beat a thoughtful and well written note. :) Oh, and for the young job seekers amongst you, I used to interview hundreds of MBA’s from “ivy league” colleges seeking jobs in management consulting and corporate finance, and the folks that had good credentials, good interviews, and on occasion, that well written thank you note — almost always made it into the next round of interviews. So it isn’t JUST an air-headed skill for the “sosyal” set… add it to your arsenal of business skills, and you may be surprised yet. Hey, I’m 24 and I always feel like I’m from a different era… I like (like probably being an understatement) writing letters and notes to friends/acquaintances even for no reason at all, though I don’t have the penmanship to back it up. But hey, a good pen sometimes makes up for it, hehe. For me it’s another facet/category of People Skills that although isn’t as desired or as impressive as being a good speaker or being able to talk to people easily, it’s something that’s a lot more personal and more easily accessible method to “relate” to people. about five months before my wedding, i had to go to japan for six weeks for work. hubby-to-be and i pledged to write each other every single day, and we did. the letters took five days at the very least to go from davao to nagoya and vice-versa. on weekends since the post office would be closed, we’d still write each other but mail three letters (for saturday, sunday and monday) each monday. what joy to get one letter everyday, but it was pure bliss to get three letters on friday, or the following monday. it was frustrating and anxiety-inducing at times (on weekends whewhen the mail skipped days, sometimes), but incredibly romantic and soothing. i cannot imagine email and tweets and text messages conjuring the same feelings	. when i tell our sons this, they shake their heads in disbelief! and yes, since i started using computers, my handwriting has deteriorated to a point that it is sometimes unreadable even to me. i do love stationery and notecards, though, and can’t resist getting a box especially when they feature nice artwork, whimsical crafts, or beautiful paper. and oh yes, that’s beautiful handwriting on your card! Romance might have migrated to other forms but beautiful handwritten notes are still my eye-candy. The importance of penmanship education flares up intermittently in fountain pen collectors’ fora. There is a tiny minority vehemently opposed to it because apparently, there are individuals who simply are not endowed to write regular consistent letters no matter the amount and intensity of training. To my mind, that’s like not teaching reading at all because a few individuals are dyslexic. Gathered too that quite a few number of schools in North America have now dropped the teaching of cursive (linked, kabitkabit) replacing it instead with training on keyboard skills. Although keyboard skill is crucial for survival in this day and age, in the time and place where I came from, one determined your level of schooling from the ease with which you wrestle with your writing implement to draw your sign. Oh, we also wrote to each other as our main mode of communication over distances. It looks like something from the sage family, but try rubbing it between your fingers to release the oils and find out what it smells like. And handwriting – I had a Grade 1 teacher who was such a stickler for handwriting she tore up anything less than perfect. (Miss Cachola,where are you?) But I did grow up to have quite nice handwriting despite a slightly bent finger in my right hand, and survived to do a literature degree at a famous English university where exams involved writing with fountain pens for 6 hours a day in rooms where the windows had been sealed shut for several hundred years, yet we still had to wear woolen gowns in the middle of summer – thanks to Miss Cachola, didn’t raise a sweat. However, I can’t write nearly as well since tearing a tendon in my hand while in labor with my 2nd child (don’t ask). Indeed, nice penmanship is getting close to being a lost art form. Writing notes and letters is a thing for the older generation. I remembered in grade school we used to have a writing class where we had to follow certain curves and has to be within 2 lines and not go over. I dreaded this exercise not knowing that it is the formation of good penmaship. Thanks to my teacher’s adamant persistence that we all do this at least one class a day, I can say that my penmanship is passable. Nowadays, kids write in print because as Footloose has indicated, in America the schools no longer teach cursive. (It is not the handwriting but the content, kuno). And with everything done online, all the more it is being pushed back. Ay, I miss the good old days. My sincere gratitude goes to my Grade 1 teacher who taught me the basics of good penmanship. My notebooks always gets to be shown during exhibitions back then! To this very day, each time my hubby needs a hand written note, he asks me to write them for him. He often asks me why is it that Filipino penmanship sort of looks identical in some ways?!? 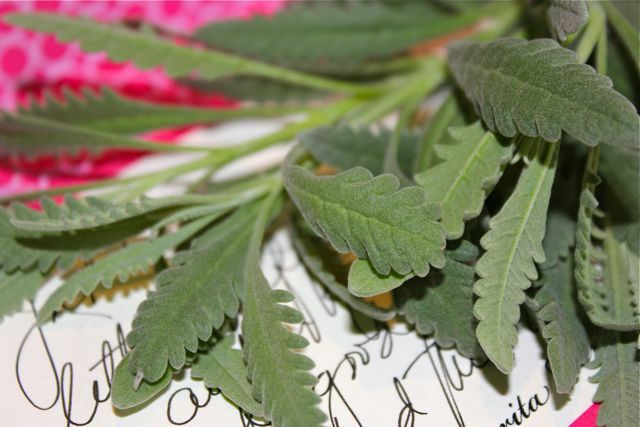 As for the herb, MM…best to google it for if it Russian sage, there are few misconceptions about the herb…some say that the leaves are non-edible and the flowers can be used in salads. Also, you can identify the herb with its leaf margin. Maybe KURZHAAR can shed some light into this! MM…this is a side topic…when you were over here, did you get the chance to eat a GRAPPLE? A friend gave me a pack pf GRAPPLES yesterday and it is excellent! I must admit I am hooked to GRAPPLES from now on. In case anyone is wondering..it is an apple infused with Concord grapes. The process of infusing it with the Concord grapes is patented. The older Filipino nurses have beautiful penmanship..before the age of computer charting, we were commended for this. “It’s the Catholic nuns influence” , our coworkers often say. (Baptist Missionaries in my case). In the days of yore, the nuns in Assumption and St. Scholastica’s had a specific way of teaching penmanship to the students where almost everyone had the same handwriting specific to the school. I think both schools have almost similar handwritingstyles . Assumption is a bit pointed and St. Scho is a bit rounded. It is the German influence. Albeit, they were beautiful	and very branded. I have no idea if they are still doing the same. (teaching handwriting). Amusing that this post gets more comments on the art of handwritten notes rather than the identity of the mysterious herb! 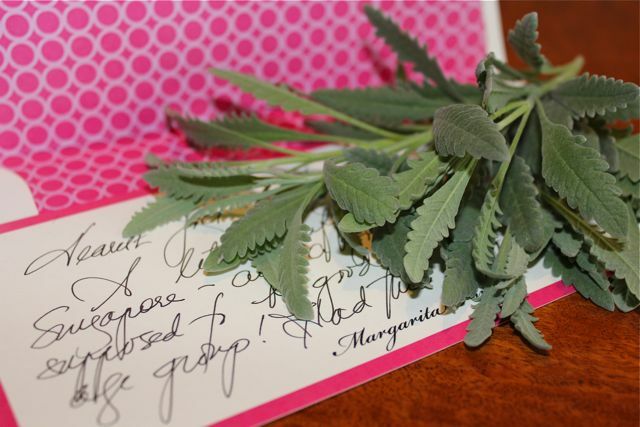 So was this herb acquired locally or a gift from Ms. Margarita(on her Singapore trip)?BTW, Ms Margarita has very good penmanship–style looks familiar from a good old school in Manila? The Russian sage in my garden has much more deeply divided leaves which give the plant an lacey texture, but there are multiple varieties of “Russian” sage as well as related species in this genus (Perovskia). Perovskia spp. (and true sages, genus Salvia) are in the mint family and have square stems which become woody after the first year. Like other mints (and sages) these plants cross readily. I understand Russian sage is not terribly toxic, but I grow so many other true sages that I view Russian sage as primarily an ornamental and insect-attracting plant. More importantly, what does your specimen smell like? Russian sage has quite a strong scent of thujone and so if you were to use it I imagine like any thujone-containing herb (true sages, wormwoods) you would want to use it sparingly. A good penmanship is something that speaks well of a person. For me, it also means that the person cares enough for the person reading his message. Especially if you tend to get lost in your own handwriting, oh well, how do you expect another person to be patient enough to read your written thoughts? The penmanship looks like Assumption style writing. Very nice! In the international school world aka mine a handwritten note at job fairs is a must. You never know how a recruiter will respond to a nice card slipped into their folder after an interview with them. I used to detest the nuns that required us to spend soooo much time honing our handwriting skills. They used to tell us that it is a skill which needs to be practised often to be perfect. Now, I remember the nuns when my hubby compliments the letters and cards I give him and says my handwriting is beautiful! I think he prefers them more than the material presents! The legal weight of a hand-wrought signature is enough to put the “digital dominance” to rest. Would anybody accept a land title for instance that was attested to in closing by some cute, techno-savvy smiley? @ MP, unfortunately, not a few of those repressed desiccated turds (strong language, I know) were rigid martinets who terrorized helpless young minds and were therefore equally responsible too for students who revolted against penmanship training of old. To this day I still feel particular disgust toward those who ignorantly bullied with painful blows of a stick southpaws into scribbling with their non-dominant hand although I am not left-handed myself. Footloose, I was a “victim” of terror nuns who loved tapping my small hands using a stick if I missed a stroke or two. This admission dates me of course, as child abuse was not in anyone’s mind when I was in grade school. I had a rather unpleasant experience with our handwriting exercises (they used to be called that in our school) but the compliments received from my hubby seem to have vanished those awful memories. So in my penmanship case, the result justified the means, so to speak. But then again, I also had a terror piano teacher who used the same tactic and now, I can’t play the piano to save my life…. Footloose: I was in your neck of the woods few weeks ago…tried to google you but nada! i wanted to have kape-kape with you and my nephews! Sayang…I brought some goodies for you …maybe next trip! I have terrible hand writing but do recognize the added value a hand written note brings. Those leaves looked very similar to some plants I have which came from Ilog Maria and they said they were a type of Lavender. I have had these plants for close to two years now and they have refused to flower… I guess it has something to do with our lack of a winter in the Philippines. Best way to find out is indeed to rub the leaves between your fingers to intensify the aroma. Agree very much with the value of hand-written notes and letters. Unfortunately for me I have terrible penmanship. I better join my kids’ writing club (run by their Mom!)! Another thing with hand-writing as opposed to merely typing – looking back at entries I had written in my journal years ago, about goals, dreams, aspirations, I find that many that I had written down had somehow come true, had been achieved. Perhaps not right away, but by writing things down by hand, maybe, one imprints them deep within, beyond consciousness, where one can never forget … A close friend of mine dismissed this however, declaring: “hindi, matanda ka lang, hindi ka kasama sa computer generation” (“no, you’re just plain old, you’re not part “…) – ha ha! MP, same experience with the piano teacher. to this day, I have a disdain for Mongol pencils. @ Millet, See that? They even gave Mongol, a popular English term for lapiz, a bad name. @Footloose, had to be Mongol #2 to be acceptable	to the teacher. I remember surfing long ago a website that could help identify a plant by the shape of its leaf. Can’t seem to find the website now. But I stumbled on a mobile app that tries to do just that. Snap a photo of the leaf and it will try to identify the plant for you. The name of the app is “Leafsnap”. Prosciutto & Chico, or Mango, or Chicharon?! ?